Spinach stuffed chicken breast with artichokes is an easy way to make a cheap staple stand out. 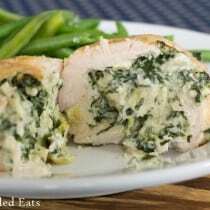 With a stuffing of spinach and artichokes, these Artichoke Spinach Stuffed Chicken Breasts are special enough for company but easy enough for every day. One of my closest friends Daria and I like to cook together. We get together on a weekday and meal prep while our little ones play. She came over in April and in about two hours we banged out a few trays of meatballs, cilantro lime chicken, and a big batch of these stuffed chicken breast. 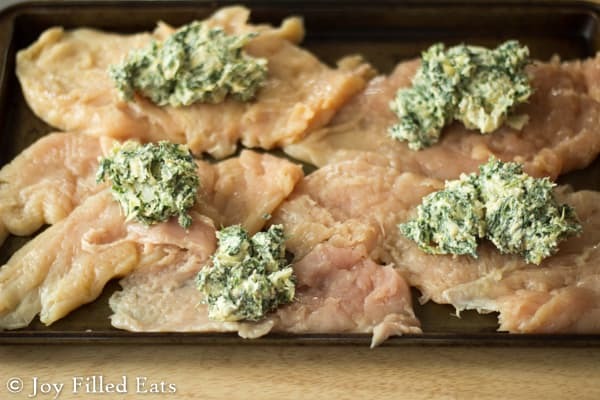 Can you freeze Stuffed Chicken Breast? Absolutely! This makes 12 Artichoke Spinach Stuffed Chicken Breasts. You can half it if desired but they freeze well. I like making the entire batch and freezing them individually for quick meals. We both froze the spinach stuffed chicken breasts individually wrapped so we could pull them out for home date nights. My husband and I try to get out a couple times a month alone for dinner. We think it is really important to have time without the kids to just talk and be together. But babysitters can get expensive. There are many weeks that we just have a date night at home. We let the kids eat pizza and watch a movie in the living room and we’ll eat alone in the kitchen. Having a Artichoke Spinach Stuffed Chicken Breast stuffed and frozen makes a delicious but easy meal for our home date nights. I cooked some of these in my instant pot right from their frozen state. Just put them in, set the timer for manual high for 10 minutes and we had a delicious dinner entree! 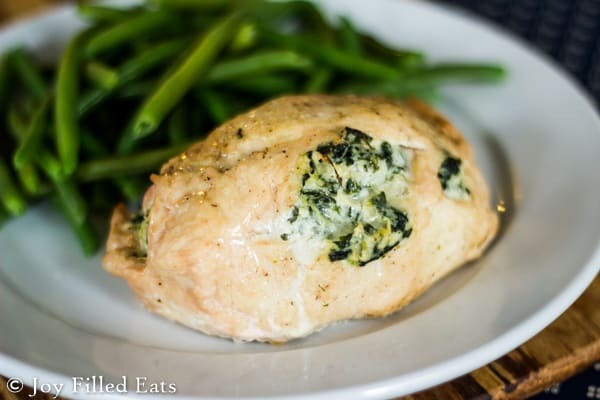 The spinach and artichoke filling for stuffed chicken breast are so good I have a hard time not just eating it with a spoon! You can make the filling into a dip by just adding a little sour cream and mayo. We love it that way with fresh veggies! 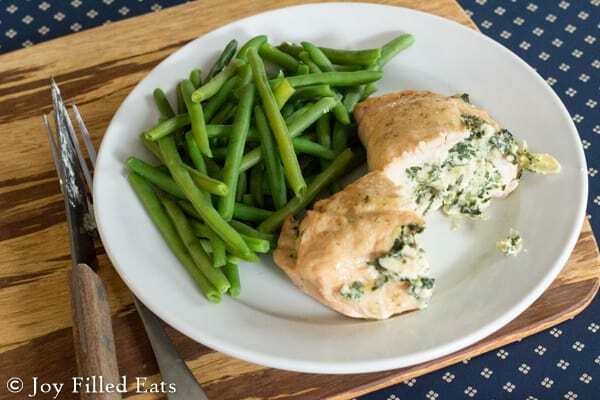 What to serve with Spinach Stuffed Chicken? Most nights I throw a couple of bags of steamable vegetables into the microwave to go along with our protein. Those plus the standard fare of raw veggies dipped into homemade ranch is enough for my family. In the summer we lean towards Caesar salad as our favorite side dish. Some other great choices are Garlic Broccoli, Roasted Cabbage Steaks, and Roasted Brussels Sprouts. Stuffing chicken breasts is an easy way to make a cheap staple stand out. 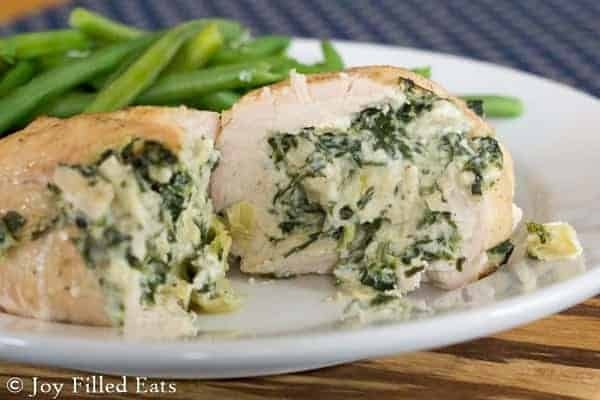 With a stuffing of spinach and artichokes, these Artichoke Spinach Stuffed Chicken Breasts are special enough for company but easy enough for every day. 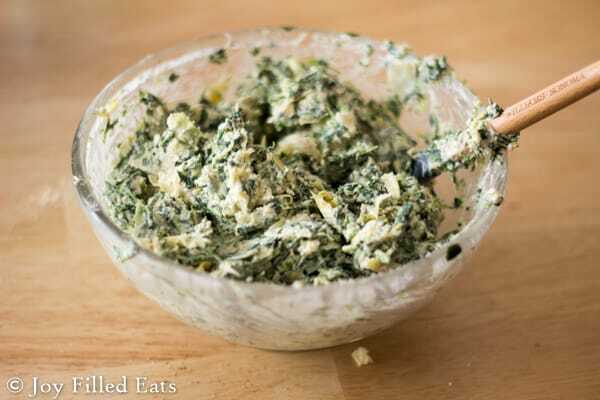 Combine cream cheese, artichokes, parmesan, spinach, and seasonings. Mix well. Set aside. Pound chicken into thin pieces with a meat mallet. I normally cover it in plastic wrap to avoid splatters of chicken juice. Spread out all the pieces of chicken on a couple cookie sheets. Divide the filling between them all. It helps to do it this way so you don't run out of the filling or end up with some left over. Roll up the chicken. Sprinkle each with a little garlic salt. 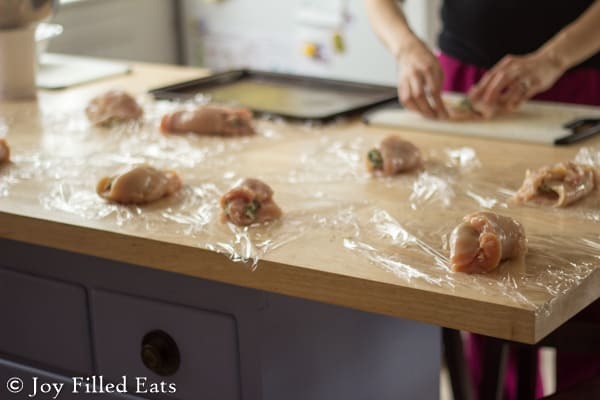 Wrap each piece individually in plastic wrap if freezing. Or put seam side down in a casserole dish to cook immediately. To cook: Thaw chicken breasts overnight if frozen. Bake at 350 for 35-45 minutes or until the inside registers 160 on a meat thermometer. Originally Published June 14, 2016. Revised and Republished on January 3, 2019. These were so good! They do require some prep and I was intimidated by it at first. Easy peasy!! Have made this several times and some are in the freezer! Thank you for your great recipes! Can you use fresh spinach and do you know how much, if so? I'd suggest sauteing it first or it will release a lot of liquid when cooking and the filling could be runny. It cooks down a lot. I'd try a pound. This was absolutely fabulous. I didn’t roll mine, I was swamped the day I made it...I put the chicken on bottom of a casserole dish and then topped with the filling. I covered it for half the baking time because I wasn’t sure without it being wrapped in the chicken if it would get to over done. It was perfect. I am thrilled...because one side of the dish I did boneless, skinless thighs, the other side, boneless skinless breasts...so every one was happy and the chicken was so succulent. THANK you so much for sharing...I have needed some new inspiration!! I just put mine in the oven unrolled too. Did you cook it for half the time or did you keep it covered for half the time? I'm so excited the stuffing was amazing before it was even coomed! This looks absolutely amazing I cannot wait to try! My family absolutely loved this chicken! Can't wait to make it again! I have cooked these in my instant pot. I stuffed them and froze them. I added them to the pot on the rack with a cup of water in the bottom. I think I cooked them on manual high for 15 minutes. The proper internal temperature for chicken, even when stuffed, is 165 degrees for 15 seconds. You definitely dont want to undercook it! This is a very good read. http://www.seriouseats.com/2015/07/the-food-lab-complete-guide-to-sous-vide-chicken-breast.html It basically says that 165 is recommended as an industry standard to simplify things. Because at 165 bacteria dies instantly. But at 160 (which I recommend) the chicken has to stay at 160 for 14.8 seconds to kill the bacteria. Unless you are plunging your chicken into an ice bath once it hits 160 it should stay there for awhile. My husband recently purchased a sous vide. We've been cooking chicken at 140 which makes an amazing tender chicken breast. It really is a neat way to cook. We just did stuffed pork for Christmas at 140 with this technique. It was moist and tender. typo, 2nd sentence of post: "With a stuffing of chicken and artichokes" I assume that's meant to say "... of spinach and artichokes". Thx! Thanks. I'll hire an editor someday. lol. Question...Plain or marinated artichoke hearts? This recipe sounds amazing! My family loves spinach artichoke dip sobthis should be a big hit! 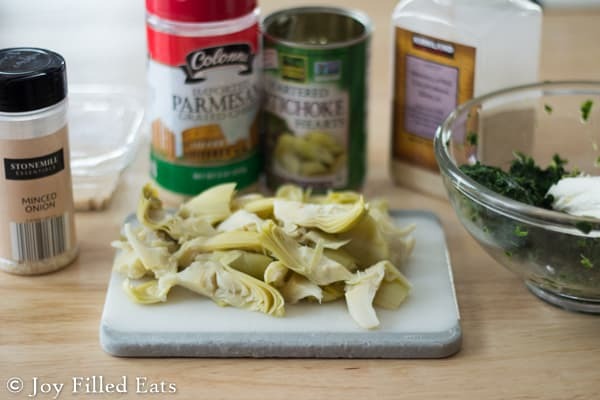 I use canned plain artichoke hearts. Marinated work also, just drain them well and rinse them. Otherwise, the filling can be too salty. Absolutely amazing!! My 9 year old loved it, I loved it, the hubby loved it and the 4 year old ate it! Home run!! I made these tonight for dinner and they were AMAZING!! The filling is wonderful all by itself, but then roll it up in some chicken breasts and you have a great meal! The whole family loved these. Thanks for this recipe. Blessings!